As many of us get a Monday off in honor of the country's most esteemed caretakers (or maybe because we live somewhere in the one-half of the country that is currently being blanketed by snow and/or ice), some members of the pro-cannabis crowd take Presidents Day as an opportunity to remind Americans just how friendly our founders were toward their highly esteemed herb. "Did George Washington Use Medical Marijuana?" Look, a totally legit eighteenth-century portrait! “Began to separate the male from female plants rather too late...Pulling up the (male) hemp. Was too late for the blossom hemp by three weeks or a month." Daily Beast writer Nick Sheppard's conclusions seem to be the ones that most historians come to. Cannabis prohibition in the United States has produced some peculiar cultural side effects; one of them is the urgent desire for many cannabis enthusiasts, in an attempt to legitimate their own movement and cultivate a more favorable public perception of the plant, to re-interpret or exaggerate the relationships that George Washington, Thomas Jefferson, and other popular "Founding Fathers" had with cannabis. -The half-true notion that both the Constitution and the Declaration of Independence were written on hemp paper; it is more likely that drafts of both documents were scrawled on hemp paper. To the movement's credit, there are those among its ranks who actively decry and objectively evaluate these historical stoner fantasies, but misinformation persists nonetheless, especially within the broader cannabis culture. Personally, I know these myths are simply an overreaction to prohibitionist rhetoric (which, like all propaganda, also bends the facts), and find them more amusing than irritating. 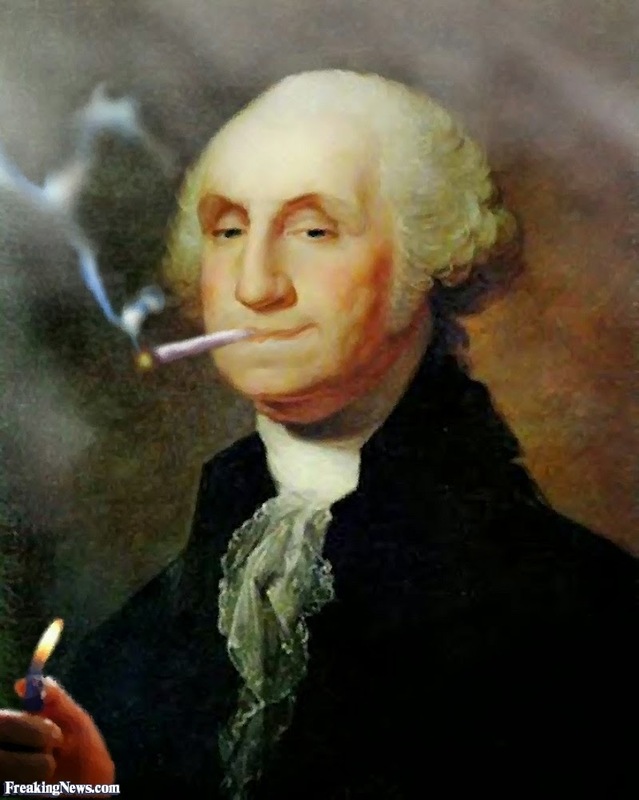 That pic of Washington smoking a J is priceless - can someone please doctor all the presidential portraits in a similar fashion? Plus, I don't think the story of George Washington and other founders growing hemp needs exaggeration to be politically effective. After all, simply pointing out that the first framers of our government found considerable value in the cannabis plant already makes the point that more modern framers of government perhaps overreacted when they declared the plant to be utterly useless and dangerous via the 1970 Controlled Substances Act.